With two prior sold-out trips, the AACA Museum urges people interested to resister early for a third trip to Cuba, scheduled for April 24-May 2, 2016. With two prior sold-out trips, the AACA Museum urges people interested to resister early for a third trip to Cuba, scheduled for April 24-May 2, 2016. 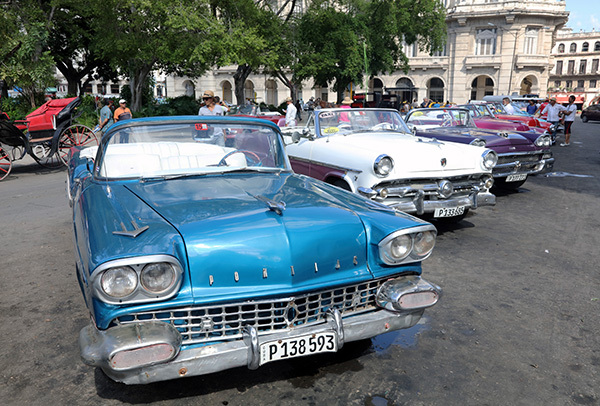 The trip promises to provide participants an opportunity to connect directly with the Cuban people and their history with cars. Highlights of the trip include a visit to a Cuban car museum and the chance to meet with Havana’s Classic Car Club, as well as visiting Ernest Hemingway’s former home, Finca Vigia. Guests also can visit a local machine and car repair shop, enjoy local fare at privately owned paladars, and tour galleries and museums. The AACA Museum will work with International Expeditions for the tour arrangements. To visit Cuba with the museum, a $600 deposit is required with the final price being between $4,995 and $5,286 for a double occupancy, or between $5,945 and $6,236 for a single occupancy with variation in the price depending on how many people attend. An additional air charter, visa and departure tax will be applied at $690 per person. Registration information can be found online at the museum’s website.